TechCrunch is reporting that Yahoo today revamped a major redesign and puts a greater emphasis on content and a customizable news stream. 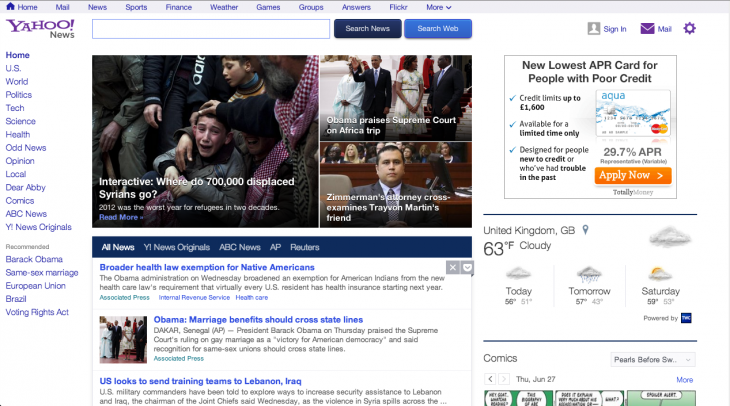 The company has rolled out an entirely new layout for Yahoo News, bringing better and cleaner typefaces with three news items now displayed at the top, with having larger one leading and two smaller bolted on the side. Further, headlines are now clearer and there’s more space for a sub-header, dragging the homepage up to date with latest happenings on display. The column below lists displays all the available news stories of the day. The news stream also updated and now customized with allowing users over the story. The news feed supports different story types while popular videos are listed on the right-hand sidebar. The new design as of now makes its debut in the United States as of now, although it’s already started rolling out in other parts of the world.